There are many who are giving words in the name of the Lord, calling them prophecy, that are not. Many have contacted me with these words that were spoken over them, asking why they were not fulfilled. GOD is not obligated to perform a word or declaration or decree that HE DID NOT speak. A true PROPHET OF GOD, will speak the WORD OF GOD. That is what a prophet of GOD is to do, always. GOD will not obligate himself to fulfill the decree, declaration and word of any person, no matter who they are, what their reputation is, or what they are called. For if we are a prophet of GOD, then we are to speak HIS WORD! Prophecy is NOT a word that is comforting, encouraging, uplifting! That is what many call a prophetic word. Prophecy is comforting, encouraging, and EDIFYING. It is exhorting. That gift does not LIFT up, but builds up. There is a vast difference. Helium lifts up speedily, until you cannot even see the balloon that rises out of sight. But the balloon will fall to the ground. The WORD of the LORD will NOT fall to the ground, but will be fulfilled! The word of man may be ever so wanted, ever so elevating, ever so encouraging and uplifting. BUT GOD is not obligated to fulfill it, if it was NOT HIS WORD. The word of man puffs up the one giving it, as well as the recipient. That word that is not fulfilled only brings the person who received it, crashing down. It is short lived. Then they ask WHY did GOD not do what was spoken over them? The answer is, that HE did NOT speak it, send them, or decree it. There are too many words being given in the name of prophecy that are damaging, because they are NOT from GOD. Those doing this can say that it encouraged others, lifted them up and comforted them. But the HOLY SPIRIT is our ultimate comforter, and if He did not give that Word, then it does NOT comfort and encourage ultimately. It discourages in the end. Be careful what you hear. Be careful what you trust. Be careful what you say and pray and declare and decree. For if it is not of GOD, then be quiet. 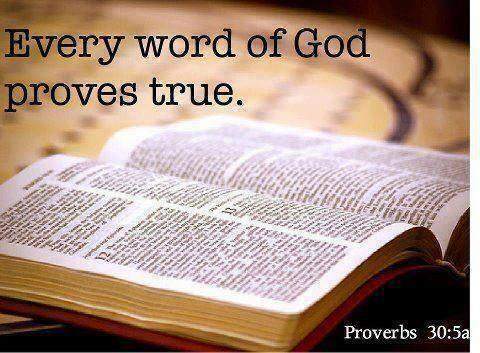 GOD watches over HIS WORD to perform it, not any word of man. The Word of the Lord endures forever! That includes the prophetic WORD that is GOD'S WORD. It will build up, not puff up. It will be performed, by GOD. Prophecy is a gift of the SPIRIT, and not everyone can prophecy. That teaching is contrary to the Word of GOD (1 Cor 12). To claim that anyone can prophecy is not true. Anyone can speak an encouraging word, but own it yourself, and do not attach the name of the LORD to it. I do not have time to do a school of prophecy. But if I did, this would be in the first lesson. Why are many teaching that anyone can prophecy? Because if they have a school of prophecy and want to SELL IT, then they need to be inclusive. They make money off their schools. God is going to turn those tables over! Yes, His sheep will her his voice and follow Him.That does not mean it is a prophetic word, or a gift. We all must listen to the still, small voice of the LORD within. A prophet is BORN a prophet, and does not become one. The school of the Prophets was not a school to train people to become a prophet, but to train them who WERE prophets, to follow the LORD, and learn HOW to be best used of GOD. True prophets of GOD do not speak what you want to hear, but speak the Word of GOD. HE may not give any word. BE QUIET and wait. We can rush in to do HIS BUSINESS, and find out that when we want to HELP HIM OUT, it is just foolish. WE must be about HIS BUSINESS, speaking HIS Word, and hearing His voice, speaking HIS DECREES, and nothing more or less.